Anyone passing the Coolshannagh roundabout recently can’t help but to have noticed construction works on the triangle of ground opposite Grahams’, enclosed by the Armagh road, the Bypass and the Ulster Canal Greenway. Formerly used by Monaghan Co Co as a place to deposit spoil from roads projects, this little patch of ground is undergoing a spectacular rebirth, thanks to a PEACE-funded cross border arts project linked to the Ulster Canal. The project is led by Blackwater Regional Partnership, of which Monaghan County Council is a member. The BRP has been working behind the scenes for many years on promoting the concept of re-opening the Ulster Canal. Last year, they received funding from the Northern Ireland Arts Council to commission three pieces of public art to be installed in communities along the former waterway. 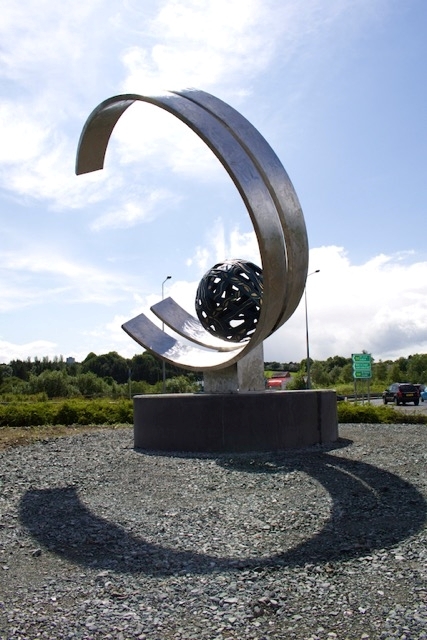 The largest of the three artworks is the Monaghan piece, with smaller installations to be placed at Middletown and Caledon to mark the significance of the canal to those two communities. The original route of the disused Ulster Canal is 78km long and lies almost exactly half in half on both sides of the border. The Canal once served to facilitate the movement of people and goods across the region; a region which was fractured geographically by the introduction of the border, and culturally by the Troubles. Now, with the advent of more peaceful times, the Canal is enjoying a rebirth, and again is facilitating the movement of people, this time along its banks which are being developed as a Greenway. The artwork was developed by artists Mark Ryan and Maree Hensey, and represents the role of the canal in the region’s history, and in its future. Two curved arms of stainless steel curl upwards, coming together at the top. The shape is reminiscent of a crashing wave, and the surface of the steel has been roughened so that when the sunlight hits it, it splits into many dancing facets, similar to the effect of sunlight dancing on water. 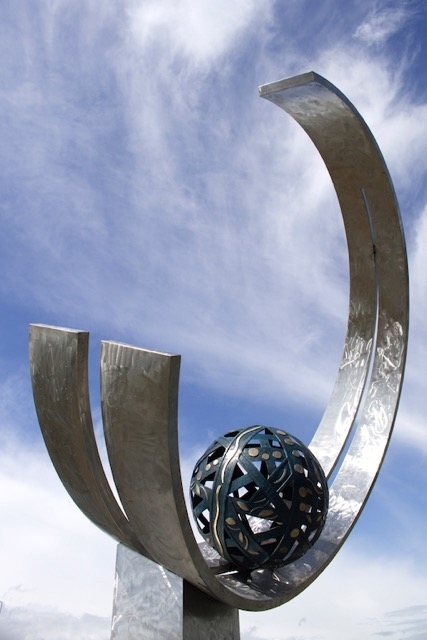 A bronze sphere rests on the arms, giving a sense of movement. 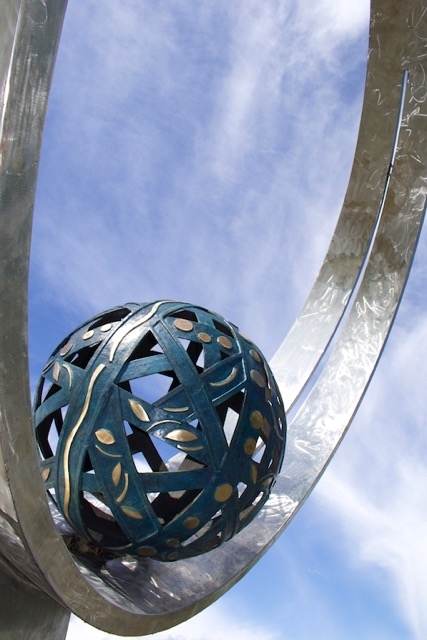 Symbols on the sphere include leaves to represent the rich biodiversity along the canal, waved lines to represent its watery heritage, and 26 circles to represent the 26 locks along the canal. The artwork is about connectivity, renewal, making a different future, finding purpose and a peaceful way forward. The artists were assisted in developing the symbols to be used on the sphere by three local groups, who participated in a series of art workshops earlier this year. Monaghan County Council would like to thank the National Adult Learning Network, the Neighbourhood Youth Project and Teach na nDaoine’s homework club for their part in bringing the artwork to life. A record of their work was placed in a time capsule and inserted into the base of the sculpture. Today marked an important date in the project, with the sculpture arriving on site and being installed on its concrete plinth. Council gardener, Dennis Flannery will now get to work on landscaping the surrounding ground and bringing his own interpretation to bear on the story of the Ulster Canal. Previous Post100,000 users and counting!Next PostGreenway Challenge – Are you up for it?